Original story published at Nofibs. Thirty Pacific warriors are currently touring Australia to share their climate message and ask for our support and solidarity. On Monday they brought their message to Narrabri and the Leard Blockade and saw first hand the destruction wrought by Whitehaven Coal's Maules Creek Project and Idemitsu’s Boggabri Coal. “We are sending a powerful message: we will not stand idly by as the coal industry sinks the future of the Pacific Islands – we are fighting for our god given right to live”, says Mikaele Maiava, for the Climate Change warriors for Tokelau in a brief statement. Four of the thirty climate warriors come from Tokelau, which transitioned to 100 per cent renewables in 2012. They are only too well aware of the negative impacts of climate change. Read the Ulu o Tokelau, Aliki Faipule Kuresa Nasau statement from 3 October and understand the motivation of not just the four warriors from Tokelau - Avelio Tumua, Dedles Suega Isaia, Aleki Manuele and Mikaele Maiava - but all the warriors from all the countries of the South Pacific. Countries that are part of the campaign include: Papua New Guinea, Samoa, American Samoa, Tonga, Solomon Islands, Vanuatu, Tokelau, Niue, Cook Islands, Federated Sates of Micronesia, Marshall Islands, Palau, Tuvalu, Nauru, Kiribati and Fiji. First stop on the tour was a visit to the First Peoples Embassy at Redfern, where our Pacific visitors were ceremonially welcomed to country. On Monday the Pacific Climate Warriors travelled to the Leard Blockade to see the destruction already being wrought on the Leard state forest by Whitehaven Coal's Maules Creek Project and Idemitsu’s Boggabri Coal. The emissions generated by the coal from these two massive open pit mines will add to global warming and contribute to the rise in sea level and more intense storms and floods which is slowly threatening to drown islands, and wash away heritage and culture. “We have to find ways to keep coal and gas in the ground. People all around the world are recognising this and taking action to challenge the power of the fossil fuel industry. For us Pacific Islanders, there is nothing more urgent or necessary.” said Mikaele Maiava, climate warrior from the Tokelau in a statement. Although Pacific Island countries only contribute 0.03% of the world's greenhouse gas emissions they will be the first to go under if the business as usual scenarios of the IPCC are allowed to come to pass. Both coal projects plan to extract over 22 million tonnes of coal, producing carbon dioxide and other particulates pollution which will have direct health impacts and indirect impacts through the global warming it helps to generate. “Coal is vital for the future energy needs of the world,” Tony Abbott said. “So let’s have no demonisation of coal. Coal is good for humanity. The trajectory should be up and up and up in the years and decades to come. The future for coal is bright and it is the responsibility for government to try to ensure that we are there making it easier for everyone wanting to have a go. It is a great day for the world because this mine will keep so many people employed … it will make so many lives better." he said. Not a mention of the pollution coal emissions causes and the increase in greenhouse gases adding to climate change. The Carbon Tracker project warns of a carbon bubble and stranded assets, highlighting that most fossil fuel reserves need to stay in the ground. The same day that Abbott was spruiking coal development to solve the world's energy problems, the Bank of England governor Mark Carney called for climate change risk to be mainstreamed. He joins a host of other financial experts highlighting that continued fossil fuel investment poses a serious financial risk in a carbon-constrained world. Carney told an audience at the World Bank that “the vast majority of reserves are unburnable” if the world is to avoid the worst impacts of climate change. “Climate Change is the defining challenge of our century, and here in Maules Creek a flashpoint for a global movement for safe climate, we are seeing genuine actions, alliances, and solutions being peacefully fought for.” said Drechsler. On Friday October 17th, the Pacific Island Climate Warriors will use the canoes they have built to paddle out into Newcastle harbour to stop coal exports for a day. They will be joined by a flotilla of other craft and solidarity action across Australia to oppose fossil fuel expansion in Australia and stand in solidarity with the Pacific Warriors. “Who else will stand up and fight for our people and our islands and culture? When will we be assured that we can continue to live without continuously fearing for the future and that of our children, grandchildren and our islands?” said Milañ Loeak, a 26-year-old Marshall Islands warrior who has travelled to Australia. “Climate change is not an issue that the Marshall Islands or Tokelau or any other island in the Pacific should be doing alone because this is a global problem. None of us who have felt the impacts of climate change should continue to suffer through them just to fulfill others’ interests. It’s wrong and it simply doesn’t work that way,” concluded Milañ. Negotiations on climate change and to reduce emissions under the auspices of the United Nations have been occurring for more than 20 years with little result. "Despite the dire implications for its neighbours, Australia has plans to triple its coal exports and become the world’s largest gas exporter,” said Koreti Tiumalu, Pacific Outreach Coordinator for 350.org in a media statement. If you’re in Australia and close by you can join in the blockade in Newcastle. The Pacific Warriors cannot block a whole coal port alone, they need a whole flotilla of Australians to join them to sustain a strong presence for the entire day. The more people they can get to join in the bigger and better the message will be. 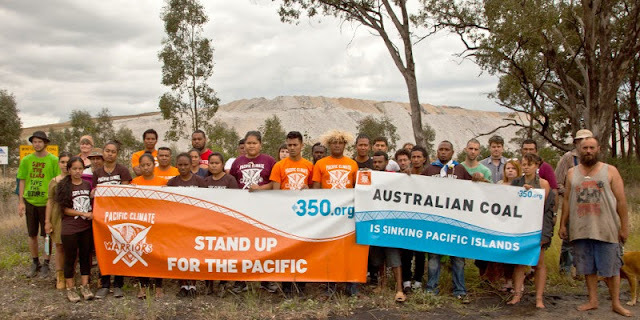 If you aren't in Australia or located too distant, then you can add your name to the letter of solidarity to stand with the Pacific Warriors and show the fossil fuel industry, and the world, that they are not acting alone; they are supported by people from all across the globe.